Description: The sun plays tricks with my camera at this angle of a east bound, with a freshly cleaned BNSF C44-9W on the point. Description: Dirty Santa Fe GP60B is the trailing unit on this EB train decending Tiger Hill. Description: Is that the German flag underneath the numerals? 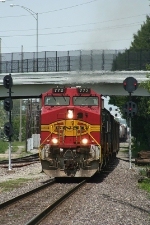 Description: BNSF 772 leads a southbound ore train through Old Monroe, Mo. Description: Westbound XC E/B end of two track. Description: Still looks good in Warbonnet paint. Description: BNSF warbonnet Dash 9 772 leads M-BRCGAL through Brookfield. Description: NS 23G passing the station in Bristol with an awesome BNSF-UP-UP consist. Description: NS 23G splitting the signals at Wyndale with a great consist.